It’s been quite a year so far for Franchise Brands, with their two leading businesses – ChipsAway and Ovenclean, reporting record results in terms of both recruitment and consumer-focused marketing activity! Having reached their century milestone last September with their 100th franchisee to join the network, things are certainly continuing to cook on gas for Ovenclean – the UK’s original and leading oven cleaning specialist, with a record seven new recruits signing up last month alone! ChipsAway, the leading brand in minor automotive repairs, is also managing to break some records and just last month achieved its best month ever, with the highest level of demand for repairs generated for the network since the national advertising activity started seven years ago. A phenomenal £3.85m worth of work was delivered to the nationwide network and these great figures only look set to continue! February saw the launch of Ovenclean’s inaugural TV campaign, which coincidentally is running for seven months, making the Franchisor the only oven cleaning company currently advertising on TV, and this has also contributed towards record leads being sent out to the nationwide network – up 50% compared to 2014! 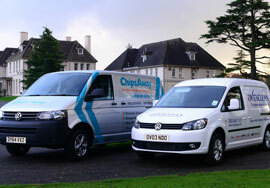 Website traffic for both brands is up substantially too compared to the same period last year – in fact Ovenclean has experienced a 56% increase in traffic, and the online conversion rate has risen by a fantastic 25% – all contributing to the rocketing levels of demand the brands are currently experiencing!